The Chained CPI, which we’ve written about any number of times, is getting support from Congressional Republicans, President Obama, and even some Democrats. The chained CPI itself is a bit convoluted, but here’s the quick and dirty: it’s a backdoor benefit cut that will reduce Social Security benefits – and it gets worse as you get older. 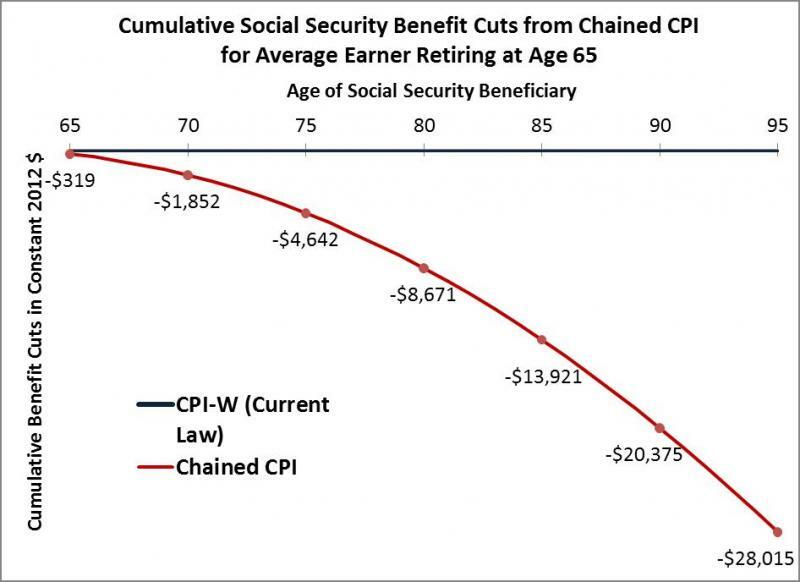 The graph below shows just how big of a benefit cut the chained CPI would represent for the average retiree. Given the implications for retirees, many Democrats (and a few Republicans) have voiced strong opposition to the chained CPI, but now David Cicilline (D-RI), has proposed a bill that pushes back against the chained CPI. The bill, H. Con. Res. 15, “expresses the sense of the Congress that the Chained Consumer Price Index should not be used to calculate cost-of-living adjustments for Social Security benefits.” Although the bill has 100+ cosponsors, currently only two representatives from Washington state have signed on to the bill, Rep. Rick Larsen (D-2) and Rep. Jim McDermott (D-7). If you are represented by either of these two Congressmen, please let them know you appreciate their support for protecting Social Security and seniors. If not, please write to your congressional representative and ask them to support H. Con. Res. 15!